Each visit starts with a customized acupuncture treatment. Other traditional modalities may be included if necessary. Please scroll to learn more. All living beings strive to maintain balance. Humans have evolved complex systems that keep the body functioning properly. Over the long-term, imbalances occur naturally from lifestyle, diet, and injuries. Unchecked, more persistent health issues can manifest as symptoms such as headaches, neck pain, fatigue, a cough, poor sleep, allergies, digestive issues, muscle spasms, etc. The goal of acupuncture is to eliminate symptoms and correct any underlying dysfunctions by bringing the body into energetic balance, and enable the body's own healing mechanisms. Acupuncture is effective for pain elimination and restoring health. No matter the symptom, we take a holistic approach and implement corrective measures from the ground up. Benefits of regular acupuncture include decreased pain, improved sleep and energy, stress relief, and enhanced mood. Every muscle and organ is surrounded by connective tissue called fascia. This fascia surrounds us like saran wrap and helps give our body structure. When fascia is dehydrated or inflamed, our muscles can stick to one another causing pain and limited mobility. The negative pressure provided by fire cupping relieves spasms and adhesions and helps loosen the muscles by physically separating this fascia. This promotes oxygenation of the tissue, improving circulation and as a result, detoxifies the body. Marks may appear on the body and the darkness and intensity show how much toxicity has built up. They can take 3-10 days to fade depending on the strength and energy of the individual. Cupping is often used to alleviate back and neck pain, but can be also used for anxiety, fatigue, migraines, rheumatism, and insomnia. It is also great for symptoms of common cold, cough, and asthma. Cupping is usually combined with acupuncture in one treatment, but it can be used alone as well. Gua Sha is a manual healing technique that releases spasms and tension and relieves pain. Gua means “scrape” and Sha means “sand”. Crunchy or knotted skin were traditionally described as a sandy texture, but are now known to be bound muscles and fascial tissue. By scraping the surface of the skin, we are able to break up any of these knotted muscles. Commonly used tools or scrapers include a ceramic Chinese soup spoon, or flat stone with an edge carved from jade or rose quartz. Redness or ‘sha’ following the treatment is common and may take 2-4 days to fade. This is the body’s natural way of healing. The patient usually experiences immediate relief from pain, stiffness, and even fever or cough. Customized herbal formula being filled Kamwo Pharmacy in Chinatown. Chinese Herbal Medicine has evolved over thousands of years. The Chinese Medicinal Pharmacopeia contains hundreds of roots, stems, leaves, fruits, skins, seeds, tubers, and even a few minerals and insects. Medicinals are categorized by function and always used in a group called a formula. A formula may be composed of a handful to over a dozen single medicinals. Formulas can be ordered raw and prepared at home. This is considered the most effective way of consuming herbal medicine since patients are engaged in preparation and formulas can be modified easily. Medicinal formulas can also be prepared in granular and prepared patents. With each degree of processing, potency is sacrificed for convenience. The purpose of Herbal medicine is to redirect our energy in order to heal. Our products are sourced from reputable distributors which follow strict farming, harvesting, processing, and manufacturing guidelines. 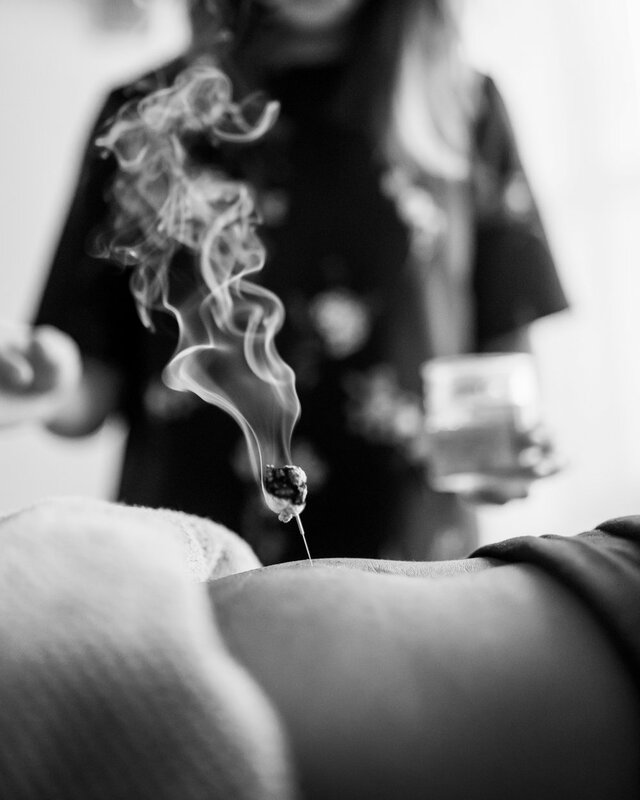 Moxibustion is a Traditional Chinese Medicine technique that involves the burning of moxa, usually made from dried mugwort leaves. Moxa comes in various different formats such as loose, cones, and sticks, all with the goal of generating heat to penetrate deep into the body. The technique is often combined with acupuncture and is very effective for pain from injury and arthritis, menstrual cramps, digestive disorders, and the common cold. Tui Na is a form of Chinese medical massage. Tui means to “to Push” and Na means “to Lift and Squeeze”. The practitioner may roll, knead, press, brush, grab, and vibrate the channels and meridians that have deficiencies or blockages. This is often used for musculoskeletal conditions, but can also be used in delicate areas like the neck and jaw. Gentle pediatric Tui Na is a way to unblock channels in infants and toddlers for digestive and sleep issues. Administering ear seeds at the GJC Annual Wellness Day. Also known as ear acupuncture, was first developed by the neurologist Paul Nogier, MD. He identified points in the ear that corresponded to the entire body. His main focus was in neurological disorders such as migraines, polyneuropathy, radiculopathy. But since then, auriculotherapy treatments have been researched to be effective for stress, sciatic pain, smoking cessation, drug detox, insomnia, epilepsy, dementia, and even PTSD. After the acupuncture treatment, we offer complimentary ear seeds which allow the patient to extend the effects of the points at home. Ear seeds are used as a form of acupressure and is non-invasive. They are often herbal seeds or silver beads taped to the ear. Patients can perform a self massage on these points and can leave the seeds in for up to 4 days. Afterwards, they can be self-removed. You will often notice us at events offering these treatments. Aromatherapy is the use of plant based oils to improve mental, emotional, physical, and spiritual well-being. We like to incorporate essential oils that target channels and meridians of Chinese Medicine. The aromatic oils unblock stagnation in the channels which enhances the treatment of other services such as cupping, gua sha, and tui na. Aromatherapy spritzes are an added touch during the treatment. We cleanse the aura of the studio daily with candles, essential oil diffusers, sage, palo santo, and incense. Sneak peak at our various liniments, plasters, and balms. Liniments, plasters and balms were historically made by martial artists for their injuries associated with training. Liniments are Chinese herbal formulas soaked in alcohol to extract the phytochemical properties of the herbs. The herbs’ healing properties are delivered quickly through the skin. The alcohol mixed with the phytochemicals sink deep into painful areas while improving blood circulation and promoting healing. Liniments are used to help manage joint and muscular pain. Plasters are herbal formulas placed on a patch slowly delivering healing properties into an affected area. They are effective for large areas of muscular pain. Plasters can also be taken home and self administered. Balms are ointments mixed with Chinese herbs and are rubbed onto wounds, burns, bruises, aches, and pain. Overall, these 3 forms of herbal medicine offer relief from arthritis, repetitive motion injuries, sprains, tears, bruises, muscle aches, tendonitis, fractures, and much more.